This dramatic image of the bride and groom’s first dance as husband and wife is one of my favorites. 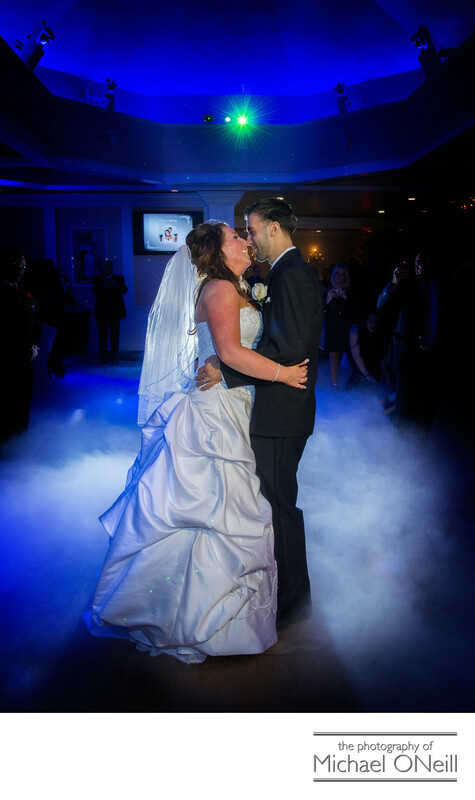 The dry ice fog machine provided a "cloud" for the couple to dance in. The deep blue LED uplighting cast a beautiful cool blue glow in the room. My skilled photo assistant, carefully positioned behind the couple, provided the rim light around the couple’s faces and a beautiful accent glow in the bride’s veil. Finally the serendipitous green laser light from the DJ’s lighting system gave the last finishing technical touch to this candid wedding photo. All technical considerations aside, I just love the amazing expressions on this couple’s faces. Proudly dancing, surrounded by their families and friends, they seem lost in each other, oblivious to all the attention from the crowd around them. Great wedding photography is about story telling and this image documents a very special moment in time perfectly. If a picture is worth a thousand words, this one speaks volumes. If you are looking to work with an emotionally-charged wedding photographer who will devote all of his attention and expertise to capture special moments for you, then give me a call at my East Northport, Long Island wedding photography studio.